The country has turned red, white and blue. I have never seen so much bunting in my life, Jubilee fever has hit. Well, with an extra day off you can’t help but say ‘Cheers Ma’am’!!! So off I went and did some shopping with my mum. We wandered into the Radley handbag store and I stared wistfully at all the handbags I cannot afford. We spotted a Radley afternoon tea set, teapot, cups, saucers the lot. Well, I fell in love with the cake stand and my mum agreed to buy it for my birthday. When we got to the till the shop assistant told us about a competition we could enter if we used the cake stand at a jubilee party. 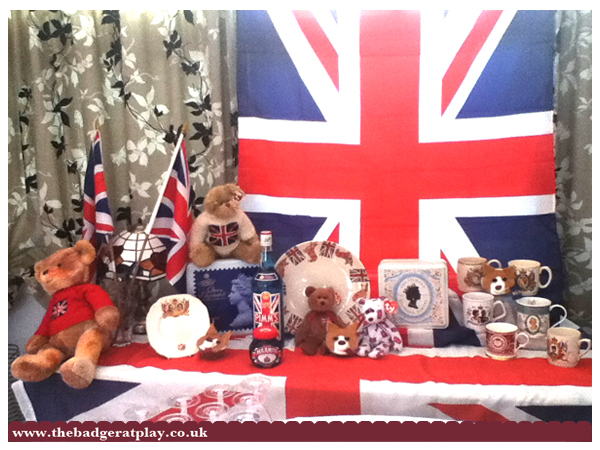 I got to use my prezzie early as we had a church girly night coming up, the theme – June Jubilee!!!! 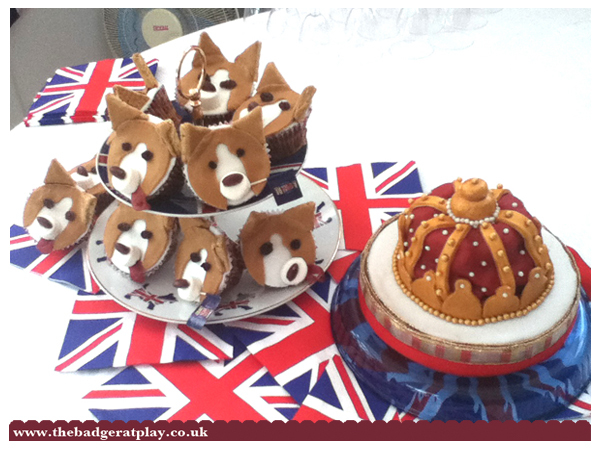 So to celebrate the Queen’s jubilee and to enter a Radley hand bag competition I figured there had to be a corgi theme. They are after all the Queens fave. 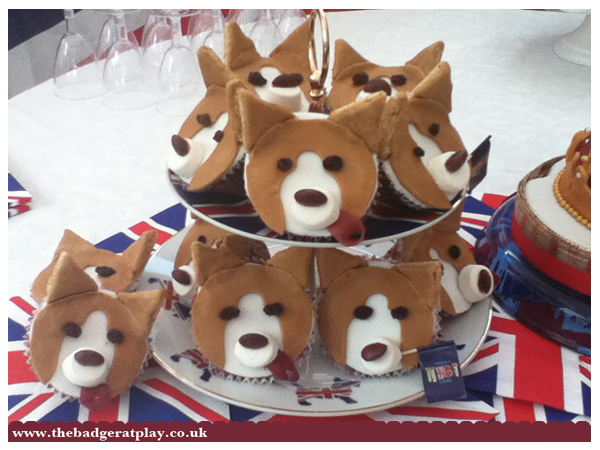 Fun Fact – The Queens first corgi was called Susan. I consulted plenty of cookbooks and even perused the internets. In the end this is an original design based on ideas from Hello Cupcake. 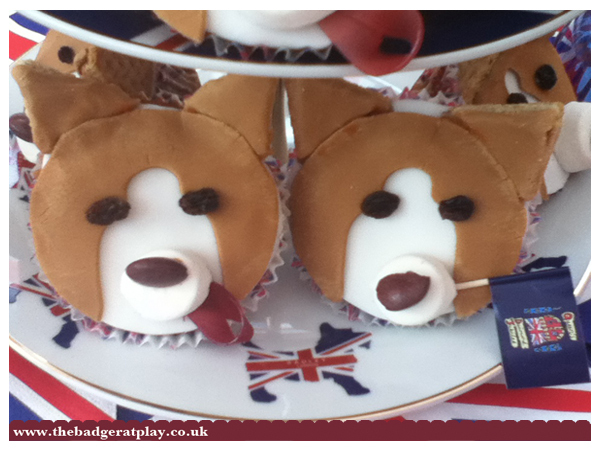 – My fave part, I used fruit winders to give some of the corgi’s tongues, cheeky chappies! It turned out great as I made each one individually, they all had different characters. 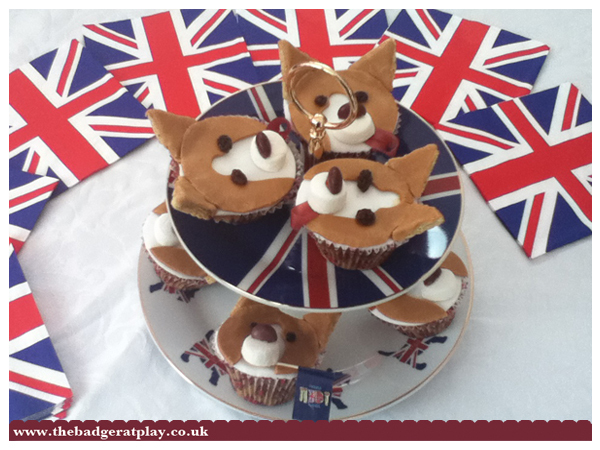 Squiffy noses, crossed eyes and flag waving corgis, all good fun. 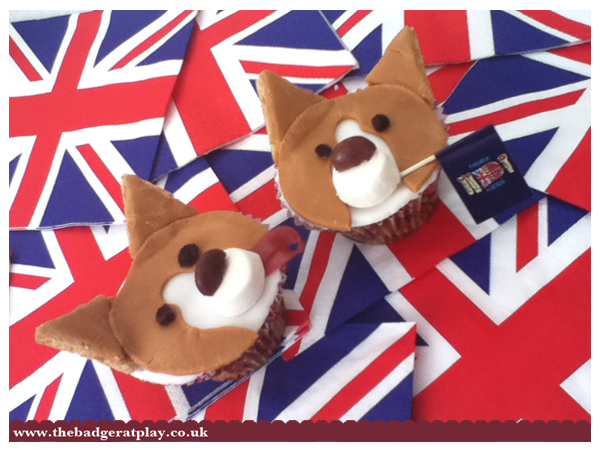 Unfortunately using a malted milk base on a corgi shaped cupcake had an unforeseen result. They tasted like the smell of wet dog. Now I have made these cupcakes before, with marshmallow frosting and they were great. We think it was just psychological because they look like dogs!!!! 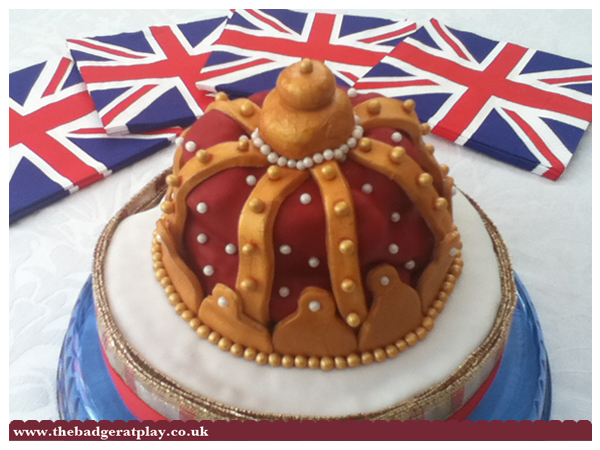 Now as it was indeed the jubilee I felt the cupcakes were not quite enough, so I also baked a crown cake. It was a ginger base, decorated with icing I had cut out and painted. The edible gold paint destroyed my paint brush though, it set solid really quickly. It was fun putting on all the gold and pearl dots though. I felt it looked just like the coronation crown. Fun Fact – the Queen practiced wearing that crown whilst giving Prince Charles a bath as a kid!! !